I woke up extra early Sunday morning for a chance to try something totally new. Air-to-air photography. 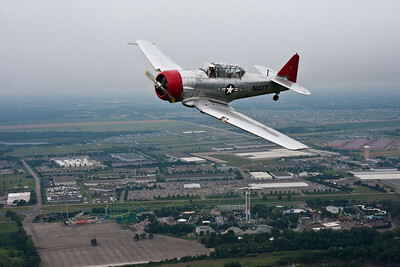 Barry Hammarback pilots his WWII Navy SNJ trainer over Lakeville. Cameraship flown by Scott Romuld. At Fleming Field in South St. Paul I met up with Scott Romuld, who would be my cameraship pilot in his WWII SNJ trainer for the hop over to to Flying Cloud airport in Eden Prairie (for the 2010 Air Expo. 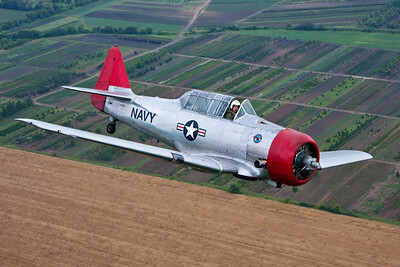 After takeoff we were joined by Barry Hammarback who joined up off our wing in another SNJ (Scott and Barry's aircraft were built in 1943 and are only 13 serial numbers apart). 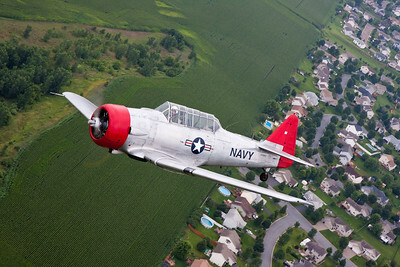 Scott and Barry fly with T-6 Thunder, a Twin Cities-based formation flying team that makes frequent appearances for parades, holidays, sporting events, and special occasions. Air-to-air photography brings a whole set of new challenges due to the cramped confines of a cockpit, the slipstream that is liable to steal your headset or camera if you stick it out too far, and the ever present vibration from the 500-hp Pratt & Whitney radial engine mounted up front. Despite all these factors, and the grey, overcast weather, I got some great shots! I owe a huge thank you to Scott and Barry for taking me up, I truly enjoyed the experience! Definitely check back for some more air-to-air work in the future, or to see what a true master of the art can do, check out Max Haynes stuff at Max Air2Air! Minnesota is awful beautiful from the air in July!